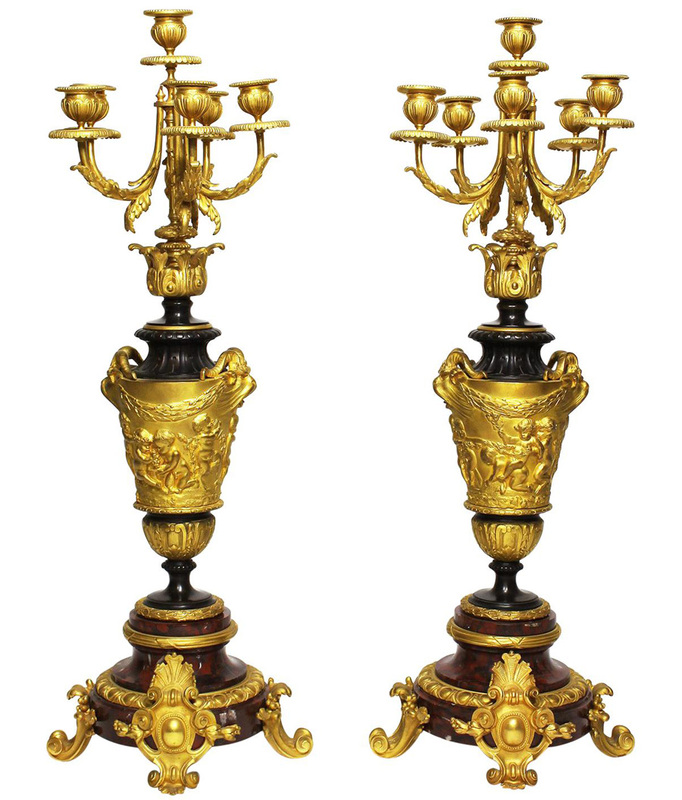 A Fine Pair of French 19th Century Rococo Revival Style Gilt-Bronze and Rouge Griotte Marble Six Light Candelabra Attributed to Ferdinand Barbedienne (French, 1810-1892) After a model by Claude Michel (French, 1738-1814) known as Clodion. The urn-shaped gilt and patinated bronze body depicting relief scenes of playful Putti below a pair of Mythological masks of Zeus and topped with a removable six-light ormolu candelabrum, all raised on a circular gilt-bronze mounted marble base. Circa: Paris, 1880. Ferdinand Barbedienne (d. 1892) began his Parisian foundry in 1839, eventually becoming one of the most active and distinguished bronziers of the 19th century. Although trained as a wallpaper manufacturer, in 1838 he changed his profession to become a fondeur in partnership with Achilles Collas (d. 1859). The Barbedienne workshops were equipped to perform bronze reduction, fine metal cutting, bronze mounting, marble work, turning, enamel decoration and crystal engraving. The firm was celebrated for bronze editions, but also produced decorative objects in styles that reflected the various exotic and revival trends popular at the time. Their work was shown to wide acclaim at all of the most important international exhibitions of the second half of the 19th century. After Ferdinand's death in 1892, the business was taken over by his nephew, Leblanc-Barbedienne, and continued production until 1953. 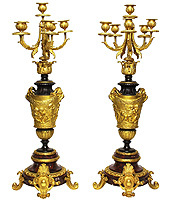 A Fine Pair of French 19th Century Rococo Revival Style Gilt-Bronze and Rouge Griotte Marble Six Light Candelabra Attributed to Ferdinand Barbedienne (French, 1810-1892) After a model by Claude Michel (French, 1738-1814) known as Clodion. The urn-shaped gilt and patinated bronze body depicting relief scenes of playful Putti below a pair of Mythological masks of Zeus and topped with a removable six-light ormolu candelabrum, all raised on a circular gilt-bronze mounted marble base. Circa: Paris, 1880. Ferdinand Barbedienne (d. 1892) began his Parisian foundry in 1839, eventually becoming one of the most active and distinguished bronziers of the 19th century. Although trained as a wallpaper manufacturer, in 1838 he changed his profession to become a fondeur in partnership with Achilles Collas (d. 1859). The Barbedienne workshops were equipped to perform bronze reduction, fine metal cutting, bronze mounting, marble work, turning, enamel decoration and crystal engraving. 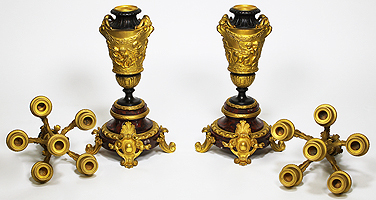 The firm was celebrated for bronze editions, but also produced decorative objects in styles that reflected the various exotic and revival trends popular at the time. Their work was shown to wide acclaim at all of the most important international exhibitions of the second half of the 19th century. After Ferdinand's death in 1892, the business was taken over by his nephew, Leblanc-Barbedienne, and continued production until 1953.